These days I have settled into a pattern for my commute (no I am not talking about the schedule–I never manage to catch the same bus two days in a row). After getting on the bus I do the crossword from the previous day’s newspaper (perhaps newspaper is not the right word for the free Metro newspaper), then maybe the Sudoku. After that, I turn on my e-reader and get into whatever novel I am reading. Though this sounds good, I am becoming rather upset with the crossword puzzle. I guess I feel as though the puzzle is rather weak. I don’t feel challenged. Don’t get the wrong idea. I am not a crossword puzzle snob. I can’t finish the New York Times Sunday Crossword. I am an average crossword puzzle solver who is terrible at any clues that revolve around geography or capital cities. However, this puzzle bothers me over little things. What are these little things? This puzzle seems to think that using possessive s on every clue is a good thing to do. I don’t know how many clues I have read that included phrases like “Mr Lenon’s” or “limo driver’s”–and those are the good ones. Really, I think the puzzle creator is being lazy. 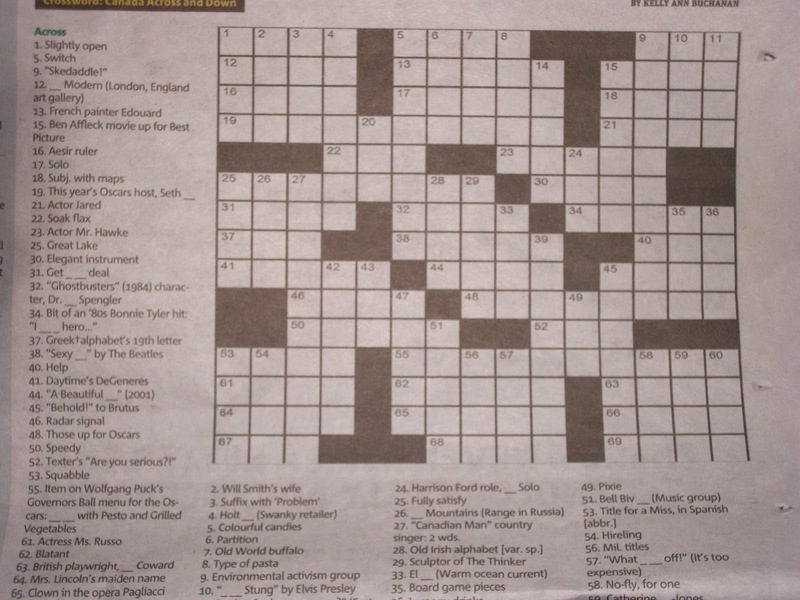 Since I am doing the free newspaper crossword, I can’t expect much…. but I shouldn’t be fed a constant diet of crap. At least once a week, I would like to be faced with an interesting puzzle. I think tomorrow I will crack open my book of logic puzzles instead. I like mental puzzles. I take great pride in my ability to do things like Sudoku, or logic puzzles, or codewords, or crosswords. I do them at home, on lunch breaks, and even in the bus on the way to and from work. This takes a bit more skill because sometimes the bumps on the road come exactly when I am writing down a crucial word or number. This doesn’t really bother me though. It isn’t the greatest frustration that I have. The greatest frustration comes when crossword puzzles are too easy, too predictable, or seemingly rather lazy. A couple of years ago at my work, several people used to do the crossword puzzle as a group. They enjoyed doing it…but after a while they had to mix things up. I came upon them one day and witnessed a strange scene. The person holding the puzzle said the answers and they had to guess the clues. They were quite proficient at it. I guess the puzzles had gotten rather predictable. As of late, the puzzles that I am doing (featured in the “free” newspaper) have been full of lazy clues. So many of them are suffixes and prefixes, or words that wouldn’t normally need an s–but do in this case only. One TV show (How I Met Your Mother) has the main character saying they always use the same clue because they need the vowels–I didn’t realize how true that was. For the next week, I won’t be doing the crossword puzzle, because it has become too predictable. I could blame it on myself. I am the one who chose to do the “free” puzzles. If I were smarter, I would go to the bookstore and get a book of tough crosswords. Then, at least, I wouldn’t complain about easy and lazy crosswords. Having too much time on my hands in the bus is both a good and bad thing. My bus is frequent enough that I don’t spend a lot of time waiting for it, but I certainly spend a lot of time on it. I read, do the crossword, maybe a sudoku, a codeword when I have them, play video games and lately, I have been doing logic puzzles. I thought I was the only one who did them because I had never seen anyone do them. Sudoku seems to be the favourite, followed by people reading, and then followed by whatever iPhone game is popular at the moment. I have never seen anyone doing a logic puzzle. And no one has ever asked me what I was doing, or stared at me to figure out what I was doing……. until Friday. On Friday I met someone who was interested and who wanted to know where I got the book. This is no big deal, but it means that I am, in my mind, no longer the only one doing these things. I am part of some group. Since the book was published and sold in a big bookstore chain, I should probably have realized this before now….but this seems more personal, more real. Logic puzzles are not the best thing for the bus. There is less to write than a crossword puzzle (I use circles and “ x”s), but more to pay attention to. I had been managing it pretty well, but I realized that for the difficult puzzles, it is difficult to concentrate. Add to this fact that I am often sleepy during the morning commute and on the verge of dozing off on the evening commute and you can see the problem. I will persevere though. 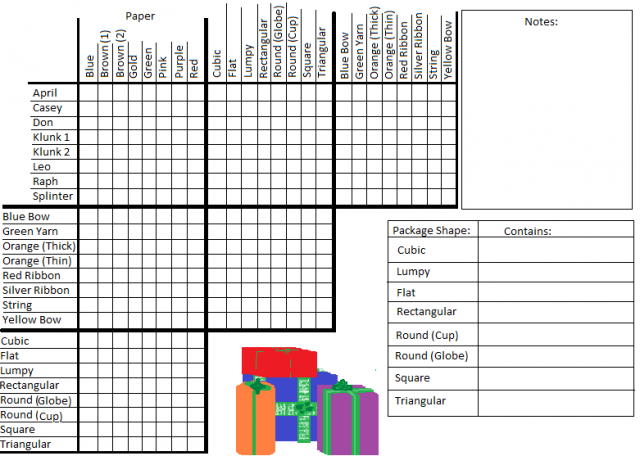 Logic puzzles are fun, and challenging. Over the years I have bought some puzzle magazines because they contained a few logic puzzles. The only problem was that I didn’t do the rest of the magazine and it sat around for years until I finally threw it out–no I am not a hoarder, but I am not a constant purger either. My current book is 160 pages of logic puzzles. I got it in the discount section of the bookstore (I guess they aren’t popular) and have done about 25 of them. After writing about my CodeWord book the other day, I spent a bit of my commute time thinking about completion. I have almost completed my book of puzzles. It might have taken me the better part of a year, but it will get done. Hopefully tomorrow on the bus I will fill out that last page. I hope I will feel some sort of satisfaction, or pride, or at least a sense of accomplishment. Applying this to my other hobbies I see that completion has played a big part in them also. Here are some acts of completion which make me feel pretty good. Putting the last piece in a 1000 (or more) piece puzzle. Taking the last part of a model from the sprue and attaching it to the model. Filling in the last square of the Saturday Crossword Puzzle. Getting the last number of a Sudoku puzzle. Taking off your skates or ski boots after a long day on the ice or the mountain. Planting the last artificial tree on the train layout. Acquiring that last country in Risk. Getting the last card for your set. The Stanley Cup Championship game. The last train stop on the journey. Writing the last postcard of your vacation. Reading the last sentence in a great novel. The last ski run of the day. Watching the last episode in a TV series you’ve enjoyed. The last piece of birthday cake. Though I love completion, I do know that procrastination has a strong hold on my life as well. I like to see some things done, but I don’t always start them on time.